Advance registration requested. Check-in begins at 3:00 pm. To pre-register, download the registration form and follow instructions for mailing or faxing. Payments by check can be mailed or by credit card by clicking the "Buy Now" buttons below. 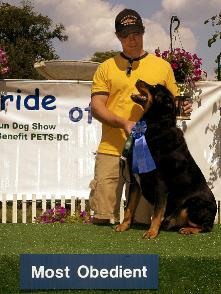 All proceeds from the show support the programs of PETS-DC. Additional donations are greatly appreciated! For more information call (202) 234-PETS. Best Tail Wagging - Dog (not the handler) will be judged on the exuberance of their tail motion. Most Affectionate - Using more than wagging tails and adorable looks, these dogs will kiss and lick their way into your heart. Vying to be a new best friend, these dogs will enthusiastically give the judges as much affection as any human can stand. 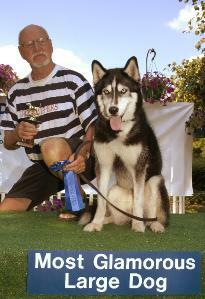 Best Mirror Image - A class to judge which handler looks most like their canine companion. Most Obedient - A chance to show off how well your dog listens to your commands. Most Original Costume - A class to judge the dog and / or handler on their entertaining attire. Please note that any costume which restricts the dog's normal range of motion, causes discomfort, or creates a hazard will not be allowed. Least Obedient - If you didn't win a trophy in class number 4, here's your chance. Most Mysterious Heritage - A class for those lovable pets whose features cross all lines of breed characteristics. You won't find this class at Westminster. Terrific Pet Tricks - It doesn't even have to be outrageous. Show off your dog's talent - at anything. Best Puppy - They're cute! They're adorable! They'll steal the show! This class is for the puppies aged 14 weeks to 6 months. The judges will surely have a tough time picking the winner of this class. Best Senior Dog - While perhaps showing a little grey around the muzzle, this class of dogs 7 years and older will truely capture the spirit of "man's best friend." The winner of this class will be the kind of faithful companion the judges would most like to have at home. Most Glamorous - Paris, Milan, New York, Dupont Circle. This category is for canines with class and a little bit of attitude. Watch out for the paparazzi! (This class historically attracts a large number of entries and may be divided and judged as two separate classes). 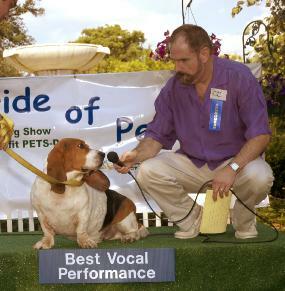 Best Vocal Performance - Move over Barbra, get out of the way Celine, this class features canine crooners with the most unforgettable vocal talents. Most Adorable (ya' jus' gotta luv' me) - They may not be glamorous but they are loving, sweet, and really glad to greet their owners at the door. (This class historically attracts a large number of entries and may be divided and judged as two separate classes). 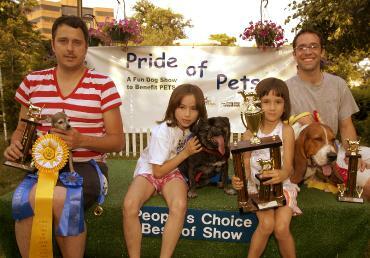 People's Choice Best of Show Award - All the 1st place winners from the previous categories are invited back to be judged by the crowd as the best of show (no entry fee required).